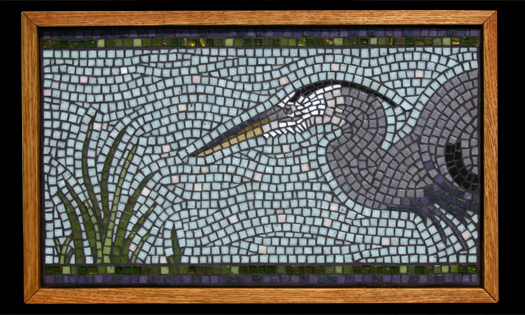 A visit from a Heron to our swampy back yard inspired this panel. There is a reason you see this profile so often in pictures and artwork, they appear frozen, patiently waiting for their lunch to walk or swim by. The simple graphic quality is very deliberate trying to use more uniform shaped squares and only adding small details in the face and a few feathers. Though the majority of the panel is very light in color I still wanted to use black grout. I wanted the obvious flow of the lines to contrast with the static pose of the subject matter. Also the black gives you the wonderful appeal of stained glass.